Nature uses exotic chemistry to build its diverse collection of molecules. Some of the oddest reactions are performed on transfer RNA. Most often, these changes are made by enzymes that capture a tRNA and then make modifications, adding additional groups or swapping out a few atoms for others with different properties. These chemical changes modify the interactions of tRNA with mRNA or ribosomes, making small adjustments that refine its function as the translator of genetic information. The bacterial nitrile reductase QueF is a key enzyme in the biosynthesis of queuosine, a modified base used in the wobble anticodon position in several types of tRNA. QueF is unusual in two respects. First, it makes its modification on a free base, instead of the normal process of modifying a nucleotide that has already been built into a tRNA chain. The new group, after a few additional modifications, is then swapped onto the tRNA anticodon by another enzyme. Second, QueF performs a unique reaction, never before observed in nature, reducing a nitrile group to a primary amine. QueF uses several chemical tricks to perform its exotic reaction. NADPH, a carrier of hydride groups, provides the reductive power. Two molecules of NADPH are needed to perform the full reaction, which poses a potential problem: the reaction must be performed in two steps. Unfortunately, the intermediate form, created after the first NADPH has performed its half of the reduction, is reactive and would easily be destroyed by water. 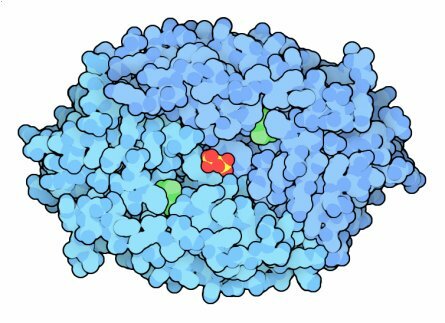 The enzyme solves this problem by using a cysteine amino acid to hold the intermediate, forming a covalent bond with it and protecting it from the surrounding water. The structure of QueF, recently solved by PSI researchers at MCSG and available in PDB entry 3bp1, reveals much of this process, and leaves some mysteries. Two subunits of the enzyme form an elongated groove. 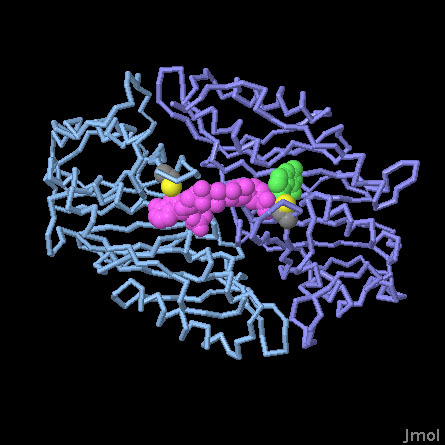 In the crystal structure, two molecules of guanine were found at either end of this groove (shown here in green), and a pyrophosphate bound right in the center (red and yellow). The little loop of protein that carries the active site cysteine is disordered and cannot be seen in the structure. Presumably it folds over the top of the groove to perform the reaction when NADPH binds. To gain more insight into the reaction, PSI researchers performed computational simulations to explore the binding of NADPH and the nucleotide base that is modified. In the final model, NADPH is stretched out in the groove, and displaces one of the guanine bases observed in the crystal structure. This computational model shows two subunits of QueF (in blue and turquoise), with NADPH (magenta) and a nitrile-modified guanine base (green) in the active site groove. The catalytic cysteines are shown with yellow sulfur atoms. Use the buttons to compare the modeled structure of NADPH with the experimentally-observed positions of guanine and pyrophosphate, and to view all of the atoms in the protein. Kim, Y. et al. High resolution structure of the nitrile reductase QueF combined with molecular simulations provide insight into enzyme mechanism. J. Mol. Biol. 404, 127-137 (2010). Iwata-Reuyl, D. An embarrassment of riches: the enzymology of RNA modification. Curr. Op. Chem. Biol. 12, 126-133 (2008).